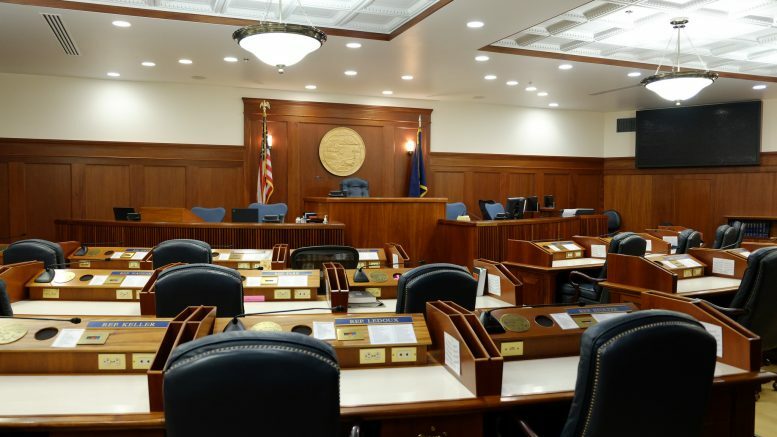 Here’s what happened on the 84th day of the Alaska legislative session. Today’s the day. The operating budget is on the House floor—although not without some last-minute shenanigans by the Republican minority—and will be going into the traditional marathon of amendments, debate and a final vote (maybe). The House floor session is set to start at 10 a.m. and we’ve heard there are north of 50 amendments in the chute. The budget will be coming to the floor at about $314 million under the status quo budget, making about a third of the cuts proposed by Gov. Michael J. Dunleavy. After much of the governor’s cuts were rejected in House subcommittees, the majority-Republican House Finance Committee worked across caucus lines to cut a whole bunch of programs, including a $58 million cut to Medicaid, eliminating the state’s dairy inspector and defunding the school bond debt reimbursement program. Even though conservatives won on many of the cuts proposed in the House Finance Committee and even though many of the cuts in the Dunleavy budget aren’t even realistic—like the $249 million cut to Medicaid that senators panned on Monday—minority Republicans made a lengthy, time-wasting pitch on Monday to start instead with the governor’s budget. The case was led by none other than Rep. Lance Pruitt, the Anchorage Republican whose wife has a communications contract with the Dunleavy administration. The attempt failed, with the House voting 24-13 to use the version of the budget produced by the House Finance Committee. Minority Republican Rep. Laddie Shaw voted in favor of the budget, making him the only crossover vote. Sen. Peter Micciche’s Senate Bill 16 passed the Senate unanimously on Monday. This is the bill that clarifies part of the state law that the Alaska Alcoholic Beverage Control Board had recently decided to crack down on, putting things like the Alaska State Fair’s alcohol license in jeopardy. It now heads to the House. Meanwhile, the House passed a revised version of Senate Bill 89, the bill that sought to rollback last year’s law that beefed up the Legislature’s conflict of interest rules. Senators had complained that the rules had prevented them from talking with the public, meeting with their doctor or even posting documents to the Legislature’s website on any issue they may have a conflict of interest with. The House version is more measured than the version proposed by the Senate, which sought a wholesale repeal of the enhanced conflict-of-interest rules. The House version maintains a reworked version of what constitutes a conflict of interest, including employment of the legislator and the legislator’s spouse. It addresses the issue around communicating with the public with the addition of a legislative finding that says it’s nothing is intended to affect those communications. In practice, said Judiciary Committee Chairman Rep. Matt Claman, legislators would be expected to declare conflicts of interest in committees and during the floor sessions so the public can understand where they stand. The existing practice of a single objection overriding the request to be excused from a conflicted vote would stand. The Mat-Su Valley Frontiersman has been producing some of the best and most challenging coverage of the Dunleavy administration, and the paper’s latest interview with Dunleavy is no exception. There’s a ton to digest from it, but the interview is worth a read in full (as well as perhaps a subscription to the paper so they can keep doing great work): Read “An interview with Gov. Mike Dunleavy,” via the Frontiersman. The governor is really heckin’ mad that the Legislature isn’t rushing ahead with his constitutional amendments and crime bills. The latest action on that front is to issue vaguely menacing threats via Twitter, pledging “no deal” if those things aren’t approved. A lot of the ire is, of course, being directed at the House even though it was the Republican Senate that said they were going to take their time with the crime bills and not give them a rubber stamp approval. It’s almost as if the governor had never passed a bill of his own while in the Legislature and doesn’t entirely understand the process, but hey what do we know? Read Governor says ‘no deal’ without crime bills, constitutional amendments, via KTUU. Be the first to comment on "AKLEG Day 84: Operating budget headed to the House floor with $314 million in cuts"